How do the playoff teams fare one against another? 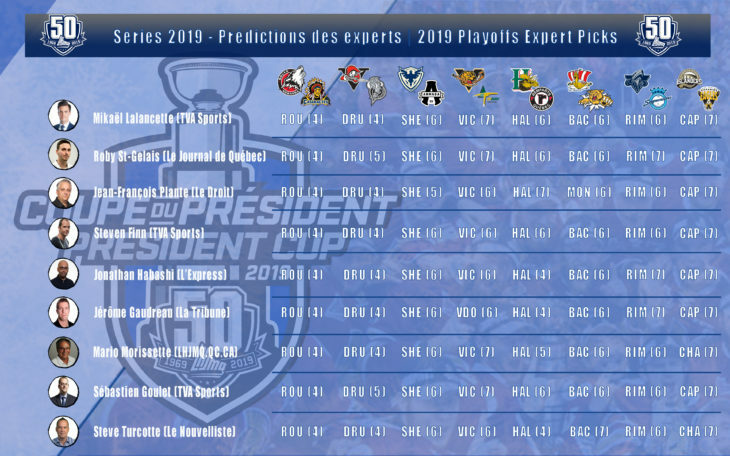 Which teams will survive the opening round of the 2019 QMJHL playoffs? Here is what our panel of experts thinks! 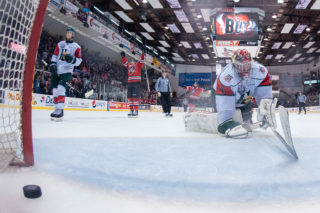 The hosts of this year’s Memorial Cup, the Halifax Mooseheads, locked up the top spot in the East’s standings on the very last day of the regular season. Head coach Eric Veilleux guides a balanced squad that was able to battle through a tough stretch of 15 games on the road to start the season! As for the Remparts, who won both meetings with the Mooseheads this season, they haven’t won a playoff series over the past three years. 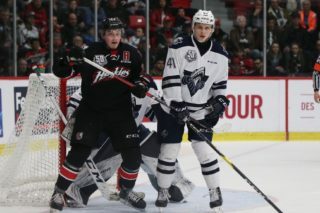 On some nights, the Remparts’ offensive hopes seem to rest solely on the shoulders of Philipp Kurashev, but you can bet Quebec still would like nothing more than to end its playoff drought in Patrick Roy’s return behind the bench. Relegated to seventh in the standings despite their 85-point season, the Wildcats will not be an easy prey for the Drakkar. The simple prediction is that this series will feature a lot of goals. Often spoon-fed by Jakob Pelletier, sharpshooter Jeremy McKenna led the league with 18 power-play goals. On the blue line, the Wildcats boast of wealth of experience and talent. But will that be enough to slow down the Drakkar who just finished a high-scoring season with a deadly power play? Probably not. 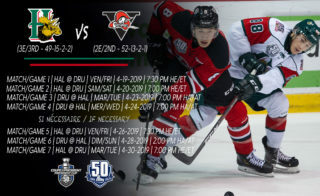 Even with the series having a 2-3-2 format, the Drakkar shouldn’t be too concerned, considering they were winners of 23 road games in 2018-19. 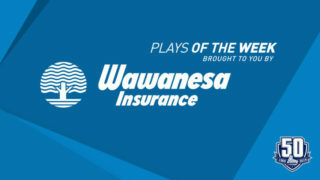 On the rise since the start of 2019, the Chicoutimi Saguenéens capped the regular season by winning seven straight games to end up with 85 points. Some skeptics will say that the playoffs are a whole new season and that Yanick Jean’s young team is still learning the ropes. 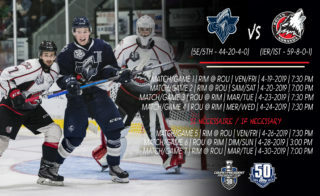 The Rimouski Oceanic will not want to make the same mistake they made last spring; their surprise upset at the hands of the Wildcats is surely still fresh in their minds. And when a lineup includes the likes of an exceptional talent like Alexis Lafrenière, two excellent goalies and quality veterans up front and on the blue line, the first round should be a formality even though only seven points separated these teams in the standings. In the end, an excellent team will be packing its bags early this spring. The Charlottetown Islanders once again delayed their rebuilding by another season even though GM/Head Coach Jim Hulton dealt his leaders Pierre-Olivier Joseph (DRU), Keith Getson (HAL) and Derek Gentile (CB) at the latest trade deadline. The Cape Breton Screaming Eagles also hit the 40-win mark this season, but going 15-2 against the Titan and Sea Dogs alone may fudge the numbers a tad for Marc-André Dumont’s squad. All told, only one point separated these rivals in the standings. To pick the winner of this series, which should come down to the small details and goaltending, a coin flip might be in order! The Rouyn-Noranda Huskies set a new QMJHL record for wins in a season with 59, and will have little trouble handling the Cataractes in this series. The Huskies’ Head of Hockey Operations, Mario Pouliot, has a team with a stout defence built around defenceman Noah Dobson and goalie Samuel Harvey. Up front, Peter Abbandonato took home the league scoring title with 111 points. It remains to be seen how many periods the Cataractes will be able to hang in there for. Daniel Renaud’s troops managed to squeeze into the playoffs despite a 15-game losing streak to close out the regular season. It’s easy to say that this series will bring some needed experience to the Cataractes, but if they get swept away in four, what will they have truly learned? 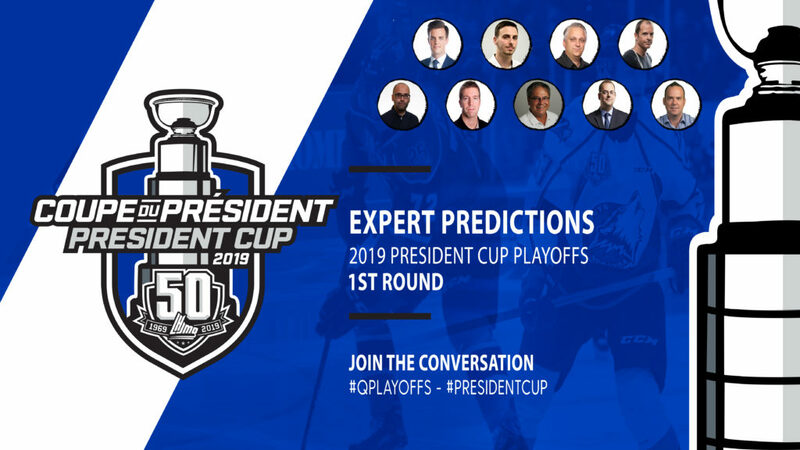 The Gatineau Olympiques have continued their rebuild that began a few seasons back and head coach Eric Landry will be missing some key elements as he tries to last at this playoff poker table. That will be especially true in facing head coach Steve Hartley who has a loaded deck and many cards up his sleeves. The Voltigeurs offence is the league’s most explosive unit, with Maxime Comtois and Joseph Veleno leading the way up front, and Nicolas Beaudin. Pierre-Olivier Joseph and Olivier Rodrique on the back end. All signs point to Drummondville not breaking much of a sweat in this series. A quick glance at the standings will tell you that the Phoenix should be overwhelming favourites in this series. There is a “but” however. as Sherbrooke only won two of their last 10 games down the stretch and haven’t beaten a team with a record above .500 since February 17. As for Blainville-Boisbriand, who traded away a number of their veterans at the deadline, they only have a single 19-year-old in their young lineup. Is it worth mentioning that veterans help teams go deep into the playoffs? If so, that would be underestimating the energy of young legs which can at times turn the tide, like goalie Brendan Cregan, who will be facing his former teammates. In the opposing crease, it will be up to Dakota Lund-Cornish to up his save percentage for the Phoenix. After a difficult opening month of the season, the Foreurs turned things around on the strength of their core group of a dozen 16 and 17-year-olds. Pascal Rheaume’s team lacks fire power, but the same can be said of the Tigres’ offence. In the absence of a turnaround, many experts predicted a season like the Titan for the Tigres. However, the production of Russians Egor Serdyk and Mikhail Abramov, combined with the brilliance of netminder Tristan Côté-Cazenave, allowed the club to amass more points than expected. 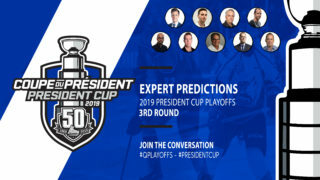 The Tigres’ 65-point campaign, which paved their way to home ice advantage in this series, will draw the ire of detractors of the league’s new playoff system. As a result of the distance travelled between the two teams, a 2-3-2 format will be in effect.